Santa Clara Junior Olympics March 2013 - Ellis Aquatics: The USA Swim Club of Tracy. 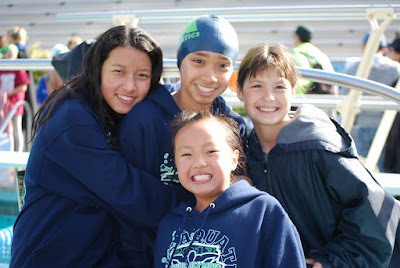 We sent 19 athletes out compete at the Santa Clara Junior Olympics over the three day weekend. 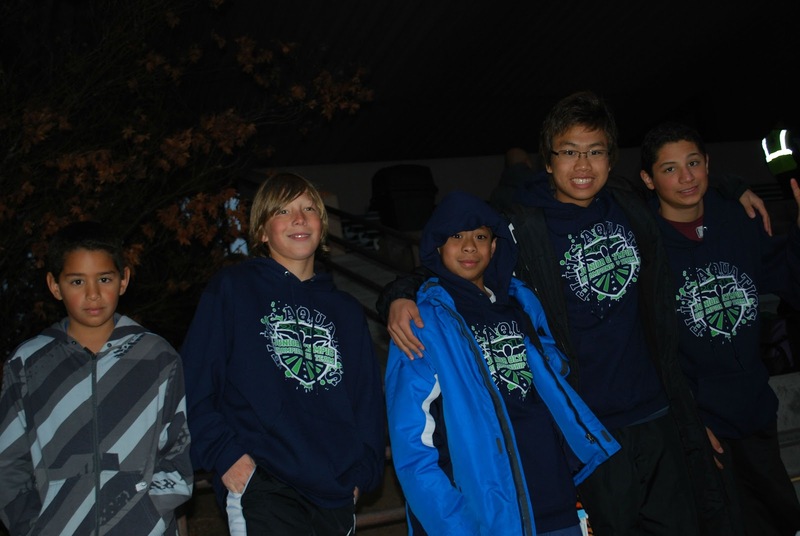 This was the first year pacific swimming split the venue for the Spring Junior Olympics and not only were we at the faster and more competitive meet, we were the 10th largest team there! This was our largest qualifying group to date and we can't wait to see the growth continue into our summer Long Course season. This was the first Junior Olympic meet for nine year old Jenika Tanjuakio (200y Free dropped 3 seconds, and 200y IM), ten year old Jilliyn Lucero, (100 back, 100 IM, and 50 Breast dropping a little over 1 second in each), and 12 year old Meigan Loomis and Caleb Andres (200 Free and dropping time in each of their events). The meet average with all teams & athletes counted for was about 60% best times and we were way over that! Congratulations guys! With the 12 and unders we had 15 team records broken and waves more of best times. We had quite a few swimmers step up to the challenge of the meet and fight for second swims. Madesyn Ronquillio dropped 5 seconds in her 100y Backstroke to move up over 20 places to finish 4th in finals with a 1:04.00, not just a new team 11-12 record but a new team record for all age groups! Madesyn also dropped another second in the 50y Backstroke to place 4th in finals with a 30.30. Brianna Carino was another to drop 5 seconds in her event, 100 Fly, to move from 1:10 to 1:05.90, a new team record in the event. Vince Tejidor dropped time in his 100 Fly as well to set a new boys team record at 1:06.08. Aaron Aguillera finished 12th in the 200y Fly with a 2:32. In the freestyle events Caitlin O'Neill saw huge time drops in the 500y, -8 seconds to finish at 5:43 and -16 in the 1000 for a 11:47 (new team record). Riley Gilmore dropped 4 seconds in his 100 Free to finish at 56.69, and 5+ seconds in his 200y Free to finish at 2:05 (both new team records). Jesse Russel-Cheung came out for the breaststroke events and got a second swim for each one, breaking the team record in the 50 33.54, 100 1:12.78, and 200 2:38. Vince was close behind in the 100y with a 1:14, and Aaron dropped 2 seconds in the 100 to go 1:19. In the IM Aaron dropped 7 seconds to finish at 5:10.65, a new far Western time in the event. 1st Junior Olympic Meet with Ellis!